Following family tradition – Bizzarrini studied to be an engineer but his interest in cars led him to apply the knowledge he gained to produce a practical output from his final dissertation. Using a humble Fiat Toppolino as the donor vehicle – Bizzarini stripped it of it’s bodywork and he then constructed a new body incorporating low frontal area, streamlined body shape and a rapidly tapering bulbous tail. He further modified its suspension and engine to produce a mini-GT car. Bizzarrini used elements of this developmental approach throughout his subsequent career. After graduating – Bizzarrini joined Alfa Romeo where he had a short initial involvement in chassis design before he moved to the much more interesting role (for him) of Test Driver/Engineer. During his tenure at Alfa – Bizzarrini worked on the ’54 Giulietta Sprint, ’55 Giullietta Spyder and the ’55 Giullietta Berlina. His skill in being able to translate issues identified in test driving directly into engineering solutions led him to a move to Ferrari in 1957 where his role quickly evolved from Test Driver to Controller of Experimental Sports & GT Car Development before eventually rising to the rank of Chief Engineer. Bizzarrini’s time at Ferrari saw him contribute to the design and development of the Testa Rossa V12 engine before moving onto the 250 Spyder California and the 250 SWB car – one of the most sublime and timelessly beautiful car designs. After working on the 250 GT 2+2 – Bizzarrini then embarked on the pinnacle of achievement in his time with Ferrari. This was his involvement in the initial development of the fantastic and now priceless 250 GTO which went on to dominate the GT field in which it raced at that time. NB: Correction – 250 GTOs do have a price! A 1962 example previously raced by Jo Schlesser, Henri Oreiller, Paolo Colombo and Fabrizio Violati was sold on 15th Aug 2014 by Bonhams at the Pebble Beach Concours D’Elegance for $38.1 million making it the most expensive car ever sold at auction. It surpassed the previous record sale price of $30 for a Mercedes W196R F1 car at Goodwood Festival of Speed in 2013! 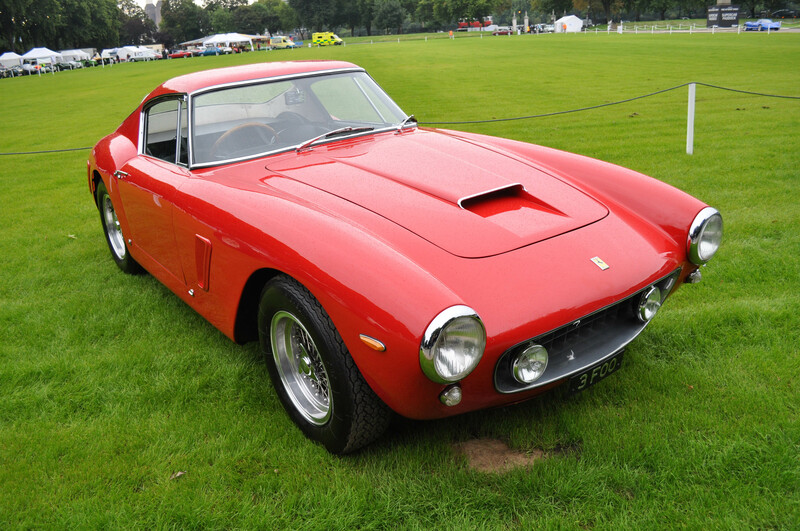 The creation of the Ferrari 250 Gran Tourismo Omologato (GTO) was spawned by Ferrari’s need to rise to the increasing competitive challenge of such cars as the E-type Jag. This low cost British sportscar was soon the tool of choice for many privateer racers and race teams on the GT racing circuit. Ferrari knew that the 250GT SWB had reached its performance limits and a new car would be required for Ferrari to remain competitive and ideally to regain dominance. During an intense period of design, development and Bizzarrini test driver assessment and modification – Bizzarini radically modified a 250 SWB car by moving the engine back in the chassis to improve weight distribution and to allow the frontal area of the car to be lowered. He further modified the bodywork by replacing the elegant curvaceous SWB rear end with a more aerodynamically efficient squared off Kamm-tail. The end result of his often round-the-clock labours was a fully working but roughly finished 250GTO. Unfortunately the job of refining the car for production manufacture of the regulation number of “Omologato” cars to compete in the GT racing class fell to Mauro Forghieri and Sergio Scaglietti as Bizzarrini became a victim of the infamous Ferrari internal politics. Bizzarrini’s stint at Ferrari ended rather abruptly when in 1962 he and 4 other key colleagues (the Gang of Five) had a serious falling-out with Enzo Ferrari which resulted in them all being fired. Undaunted – by their mass ejection from Ferrari some of this highly talented group joined together with funding from a number of former customers to form Automobili Tourismo e Sport (ATS) – a small auto-manufacturing outfit building Formula 1 and GT sports cars. During his time with ATS – Bizzarrini main focus was the design of a beautiful 1.5 Litre V12 engine which unfortunately wasn’t used in any of the production ATS cars. This failure to have his engine adopted as an ATS power power plant was a key factor in Bizzarrini’s departure but as luck would have it Bizzarrini was later able to up-scale the engine to meet the requirements of a certain Mr Lamborghini! 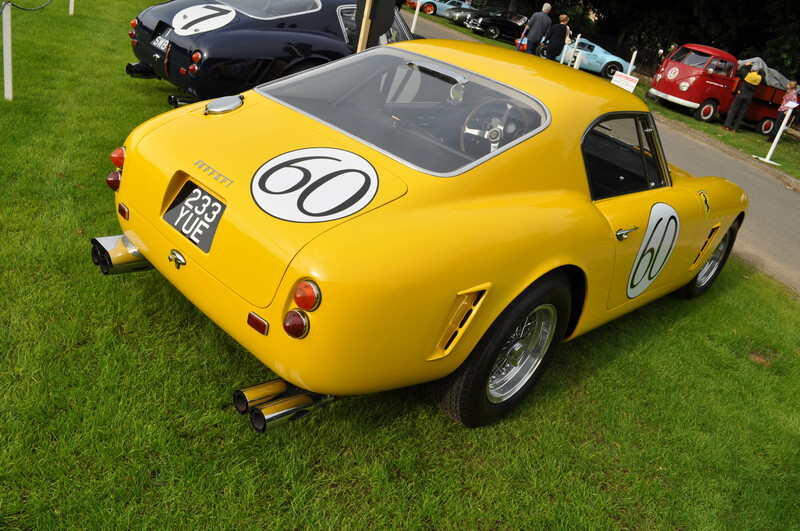 The consequence was that Bizzarrini had little involvement in the development of the ATS 2500 GT and GTS cars. During this period Bizzarrini famously and rather controversially took on a commission from Count Volpi to modify his privately purchased 250 GT SWB competition car into a 250 GTO beater. Along with bodywork specialist Piero Drogo – they managed to lower the engine and hence the centre of gravity of the car by converting it to a dry-sump set-up. At the same time they moved the engine and radiator back in the chassis to improve weight distribution. To provide a power uplift they replaced the 3 DCN Weber carburettors 6 twin choke 38 DCN Webers. All of these modifications allowed the frontal area of the car to be lowered along with the overall height of the car. Aerodynamic efficiency was addressed through a radical extension of the cabin area into a rather boxy Kamm tail which earned it the car the rather unflattering nickname of “the Breadvan” from the English and “La Camionette” from the French. The resulting car raced under Volpi’s Scuderia Serenissima team was however lighter (weighing in at just 935 Kg), lower, better balanced, more powerful and more aerodynamically efficient than the GTO. 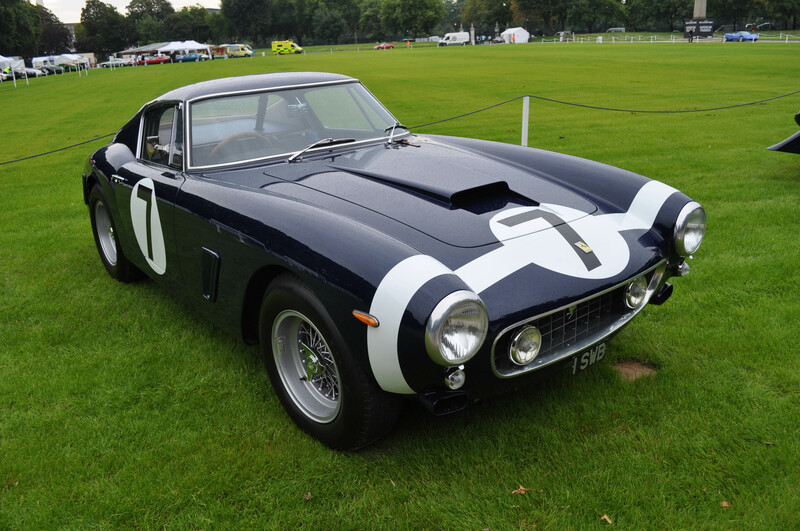 Much to Enzo Ferrari’s disgust this 250 GT SWB Ferrari based ugly duckling met its owner’s brief by proving to be faster than the “standard” GTO in a number of races although it did suffer from reliability issues. To rub salt into Enzo’s wounds – Volpi also commissioned Bizzarrini to to apply his signature modifications to his Serenissima Ferrari 250 TR/61. One suspects that Bizzarrini felt he had proved a point to Enzo following the summary ejection of Bizzarrini and his four colleagues from Ferrari by improving on Ferrari’s he’d previously worked on. Autocostrutruzioni Sicieta per Azioni – ASA for short were pointed in the direction of Bizzarrini by none other than Enzo Ferrari to help refine the 1000 GT and GTC cars. These cars were intended to be mini-Ferraris using the 4 cylinder 854 engine (originally developed by Ferrari before being sold) in a Bertone designed GT body. 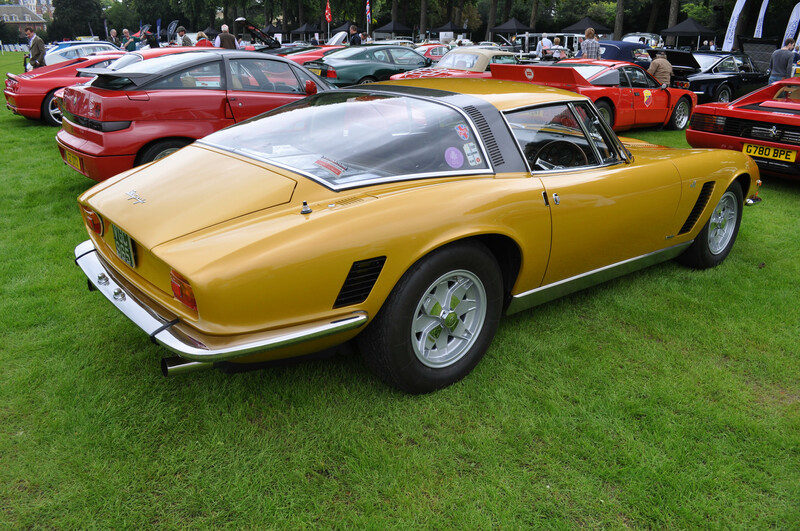 Sadly – only 50 GT cars and just one GTC car were built between 1961 and 1966. In 1963 – Ferrucio Lamborghini came knocking at Bizzarrini’s door looking for engine design consultancy. Bizzarrini was able to base the required engine on an scaled-up version of the 1.5 Litre V12 he’d designed during his tenure at ATS. Interestingly – his final payment from Lamborghini for the engine depended on the power it generated. The payment would be reduced for each 10 horsepower below the target of 350 bhp. On its first bench test it generated 360-370 bhp at 9000 rpm! The V12 engine went through numerous modifications to displacement and specification enabling it to power a string of iconic Lamborghini models starting with the 350GT, followed by the 400GT, Islero, Jarama, LM002 SUV, Miura, Espada, Diablo, Countach and in its final 6.496 litre manifestation – the Murcielago. The incredibly long production run of this V12 engine (1964 to 2010) mark it out as an engineering design classic. After ATS Bizzarrini formed a new company – Societa Autostar and through this company he became involved in some design work for Renzo Rivolta. 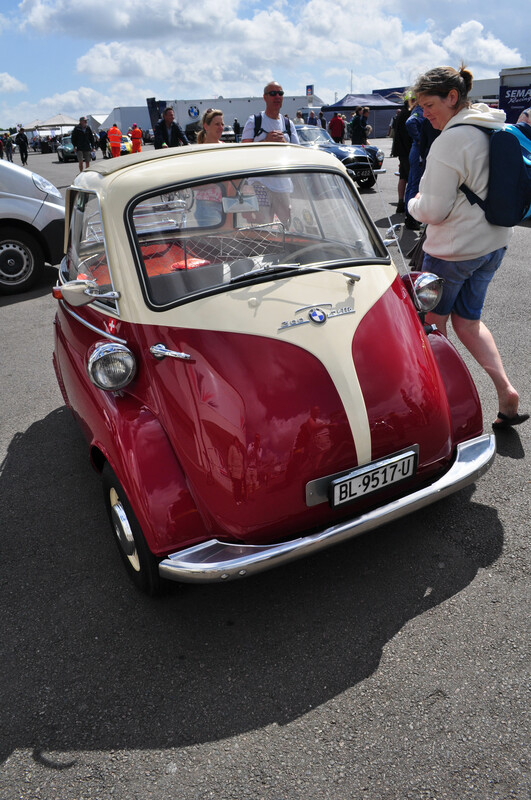 Rivolta was looking to move beyond the manufacture of motorcycles and small cars (including the license to build Isetta bubble cars) through the development of a luxury GT car to tap into the increasingly lucrative market for such vehicles. As a start point for the project Rivolta asked Bizzarrini to assess the Gordon GT (aka Gordon Keeble) as the basis of Iso’s foray into GT car manufacturing. This British car incorporated a tubular chassis, Bertone (actually Giorgetto Guigaro working for Bertone) designed body, De Dion rear suspension and most interestingly a Chevy (Corvette) V8 engine. Bizzarrini tested the Gordon GT and declared that the chassis was too flexible but he was very impressed by the engine which in his impression delivered much better power and flexibility than anything available in Italy at this time (including the Ferrari V12). His advice to Renzo Rivolta was to retain just the engine and De Dion as the basis of the new Iso Rivolta GT and he relied upon Iso’s chassis engineer Pierluigi Raggi to come up with a lightweight but rigid sheet metal platform chassis design which could be mated to a lightweight 2+2 body. He was then able to insert the proven Chevy engine and De-dion suspension into this lightweight but strong platform to create the Iso Rivolta GT. Whilst the fast and luxurious GT was enthusiastically welcomed by the motoring press – Bizzarrini’s competitive racing instinct remained unsatisfied so he started to firmly nudge Rivolta towards the manufacture of a 2 seater sportscar and this eventually resulted in the creation of the Iso Grifo . Rivolta was initially resistant to Bizzarrini’s push to develop a sports car, so Bizzarrini (with the help and encouragement of Nuccio Bertone and his young designer Giorgietto Guigaro) developed the Iso Grifo concept up to the point that it could be proven it would fill a valuable niche for the company and to show its potential as a self-publicising race car. Bizzarrini initially toyed with the idea of a mid engined configuration but he felt this would have run counter to Iso’s high performance but comfortable GT concept. He therefore utilised the principles he’d previously used to create the 250 GTO by using a front engine configuration but with the engine moved even further back in the chassis than in the GTO effectively making it a front/mid-engined car. These engines were mated to a 4 speed Muncie, 5 speed ZF or 3 speed automatic gearbox. Rivolta’s resistance was eventually broken down and the Iso Grifo went into production, but the relationship between Bizzarrini and Rivolta was strained and eventually broke down. Bizzarrini parted company with Iso in 1964 to found his own marque to develop further the Iso Grifo design in the form of the Bizzarrini 5300 GT Strada (street car) and Corsa (competition car), basing them on the Iso Grifo A3/C cars. He was able to do this as he had registered the designs and a deal was struck whereby Iso could continue to build the Grifo whilst Bizzarrini built mainly competition cars under the Bizzarrini Strada/Corsa names. This transition period was complicated and manufacture of chassis and bodies was split between Bizzarrini, Drogo, Bertone and BBM. Bizzarrini built all chassis at his workshop in Livorno with Drogo initially manufacturing bodies for competition cars and then BBM took over this role. Bertone meanwhile focussed on bodies for the A3/L’s and the 2+2 GT cars. Bizzarrini worked again with Iso during the early ’70s when he provided input to the design and development of the Iso Lele prototype, the Iso Lele Marlboro/Lele Sport and to the mid-engined Iso Varedo. All of these cars were powered by 5.762L Ford V8 engines. The first cars bearing Bizzarrini’s name – the Bizzarrini 5300 GT Strada and Corsa models came off the Livorno production line in 1965, starting with chassis number 0224 following the split with Iso. 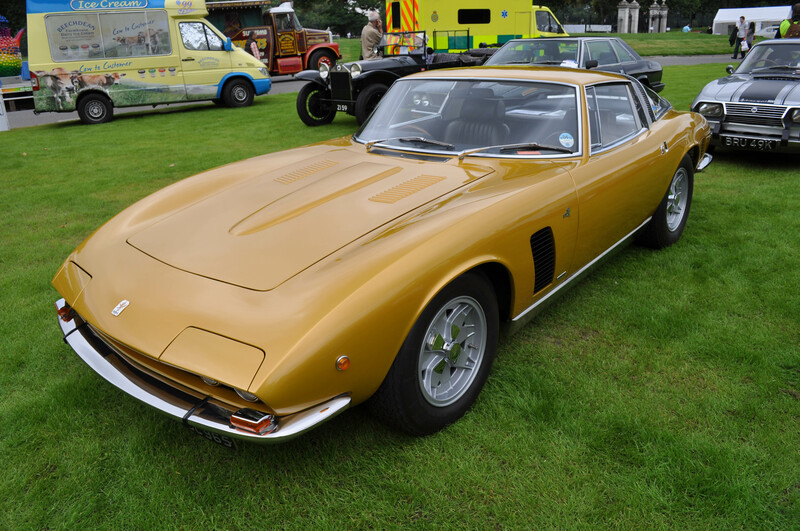 These were essentially a continuation of the Iso Grifo A3/C (which had a different body design to the Iso Grifo A3/L and 2+2 cars) but with some typical Bizzarrini modifications to improve handling, weight distribution and performance. The Strada (385bhp) was intended to be the more civilised Street version with the Corsa (400bhp) being intended for competition duties. Both Strada and Corsa benefitted from all independent suspension, 4 wheel disk brakes and a Borg Warner T10 4 speed gearbox. The robust and reliable Chevy Corvette engine was moved even further back into the bulkhead to improve weight distribution. The one downside to having the engine encroaching this far into the bulkhead was heat seepage into the cockpit which the ventilation system struggled to counteract. As a highly skilled test driver/engineer – Bizzarrini knew precisely what to do to produce an eminently drivable and competitive car. By pushing the engine right back into the bulkhead and utilising side mounted fuel tanks he created almost prefect weight distribution despite the car still being front engined. This enabled drivers on the road and on the track to push their cars well beyond what would be possible for less well balanced front-engined cars. 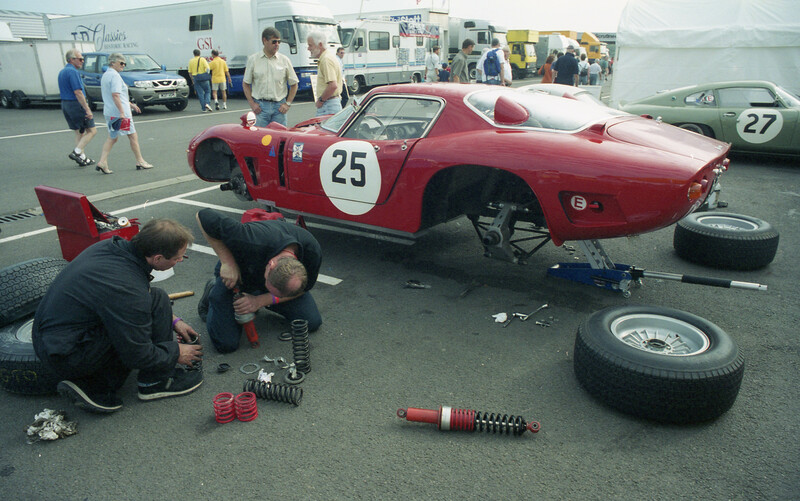 The well thought out Iso AC3/Bizzarrini 5300 GT Corsa package was very quickly able to exploit its key features of power, balance, handling and reliability in the ultimate endurance test of the Le Mans 24 Hour Race by finishing 14th overall and 4th in the 3.0L+ in 1964 (with drivers Pierre Noblet and Edgar Berney at the wheel) This was followed in 1965 by a car finishing 9th overall and 1st in 5.0L+ class (with drivers Refis Fraissinet and Jean de Mortemart at the wheel). This was a phenomenal achievement given the size of the company in relation to much bigger factory and privateer competition in the form of Ferrari, Porsche and Shelby Cobra. It also provided further confirmation of Giotto Bizzarrini’s design and development credentials across the years with various iconic Ferraris, Iso Grifo and the Bizzarrini Strada/Corsa. There’s a real elegance and refinement about the Bizzarrini Strada/Corsa which is hardly surprising given the involvement of Bertone (and specifically Guigaro working for Bertone). The sleek and low bodywork almost seems to melt down over the strategically positioned mechanical components Ieaving subtle bulges where the wheels press up into the wheel arches. It represents one of the more successful European/American hybrids in terms of the aesthetic qualities of its quintessentially Italian body, of its sturdy and powerful US engine and its racing successes. Giotto Bizzarrini was happy to continue using the Corvette engine in the Bizzarrini Strada/Corsa. He was not the first to go down this route as there was a lot of experimentation at that time in mating lightweight European body/chassis units with powerful American engines. In 1966 – Bizzarrini displayed his new baby Strada – Europa GT 1900 – a beautiful little fibreglass bodied GT using the Opel GT 4 cylinder engine. This beautifully designed car offered good performance and economy relative to its small capacity engine but investment and manufacturing difficulties meant its production never really got off the ground with only 12 cars being produced. A run of mainly one-off prototypes followed through the late ’60s and early ’70s including an interesting mid engined V8 GT built for American Motors. This period did however include some higher volume manufacture of new models with Bizzarrini’s design input by Iso – including the the Iso Lele Ford, the Iso Lele Marlboro/Sport and Iso Varedo. Giotto Bizzarrini is not a name familiar to many motorsport fans, but his contribution to automotive design and in particular to the design and development of successful GT sports cars is immense. Had investment been more readily available at the right times in his career – he and his marque probably would have gained more commercial success and recognition. Bizzarrini’s lively and creative mind just didn’t stop firing all cylinders. Rather than rest on the laurels earned from some amazing designs and creations, this straightforward and forthright engineer just gets on with penning new ideas to this day. A really good book providing fascinating insight into Giotto Bizzarini’s brilliant and uncompromising approach to automotive design. The text and pictures vividly capture Bizzarrini’s many achievements. Very excellent start and look forward to the entire alphabet! Thanks Ken. Hmmmmm ‘Q’ could be a tough one! How about “Quattro-wheelo con-sparo” – one of Gordon’s ideas for a new lightweight no-frills Ferrari – 4 wheels and no spare tyre!!! I’ll suggest it to Montezemelo. Thanks for this link. Perfect timing as I was watching a Bizzarrini Strada race over the weekend at Silverstone Classic.